1. Combine white wine sangria ingredients together and let sit for 24 hours. Strain the fruit out before serving. 2. Simmer juice until it has reduced to about 1/10 or a syrup consistency. Add the spices. 3. Fill a 35-ounce (1 L) glass jug half-full with ice. Add homemade white sangria until 3/4 full. 4. Top with 7Up. Finish with 5 ounces (150 mL) spiced apple reduction. 5. Serve in an ice-filled white wine glass and garnish with fresh cranberries, cinnamon sticks and apple slices. *Tip: I added more fruit than was called for (almost double) and it was delicious. The drunken fruit is a tasty treat on its on! This makes more than enough for a punch bowl, so halve the recipe if you’re making this for a smaller gathering. This entry was posted in Food, Glorious Food! and tagged alcohol, apple, cocktail, drink, gin, recipe, sangria, white wine by kshap. Bookmark the permalink. I would like to say that Gin and Tonic with Bombay is the best. It is a favorite of my parents (who are almost 60), but that means nothing. Maybe it just means you have mature taste. And if my family has Christmas in town this year, i’ll have a chance to try this recipe. Made red sangria earlier this year. Was excellent. Maybe a Bombay Gin and Tonic is just a classic? 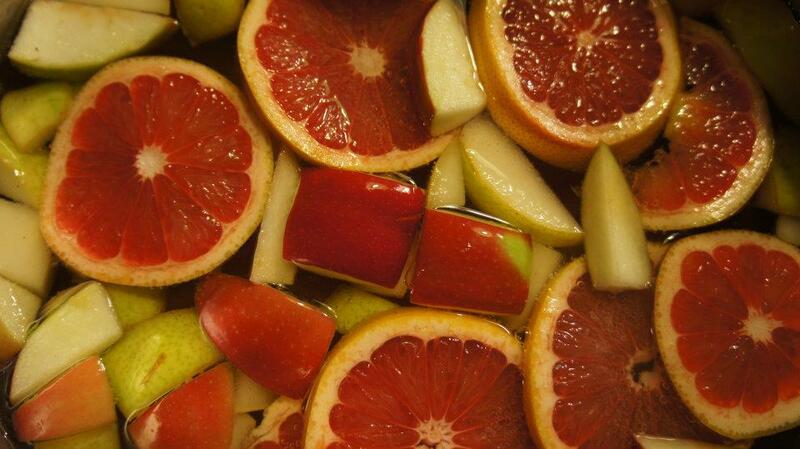 Hope you get to try the Sangria recipe! I was pretty excited about it…and I can’t remember exactly how many glasses I ended up having, so it MUST have been good. Gin and tonics for the win.